In life, we are sometimes thrown into unfavourable circumstances. We may feel it is unfair and even the heavens don’t care or that we have been forsaken. Feeling neglected, alone and victimised, a person may choose to lash back at the world…after all, the world is such a horrible place. In action led by eyes and heart blinded by anger, we may fail to realise ….that perhaps, could it be that we are just using a past event as an excuse for our own shortcomings? Yes, the past may have been harsh to us- but it’s gone now. Some people who come from bitter past could rise up from the ashes to help others or to become someone successful. The experience is there- but it’s up to how we look at it. Our past was ruined but the future is yet not known- we can rise from the despair and rebuild our future. No matter what mistakes we have made in the last- let it not haunt us… move on and make amends. The story below best illustrates this…. They went on their journey and came to a river. They had to cross the river and no one dared to bring them across because the villager said a lot of boatmen went missing. So they found an abandoned boat and as they were travelling, the boat rocked and sunk. Tang Shazang was kidnapped by Sha Wu Jing. Sha Wu Jing and his friend wanted to boil Tang Shazang to eat. Tang Shazang was not afraid and this puzzled Sha Wu Jing because most of the other humans begged and cried for mercy when they found out that they were about to be eaten. Sha Wu Jing said it was not his fault that he had wanted to eat human flesh. He said it was all due to the heaven’s fault for banishing him down with flying knives and in order to escape the knives he had to stay underwater and had to eat human flesh. Tang Shazang said it is not due to heaven’s fault. We cannot blame our own greed and shortcomings on heaven. If Sha Wu Jing was willing to chant the Heart Sutra 100 times, the knives would stop coming. Sha Wu Jing decided to give it a try- but when he chanted a huge scary black spider came- he was scared and ran back and wanted to kill Tang Shazang for he felt he was being cheated. 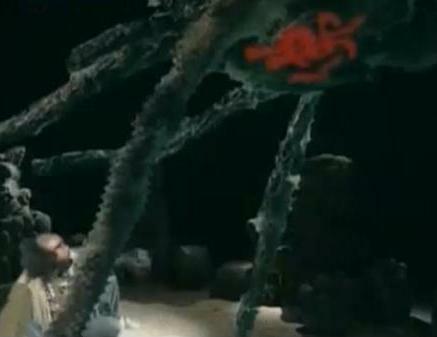 Tang Shazang told him to try writing the world “Buddha” on the stomach of the huge spider and it would disappear. Sha Wu Jing agreed to do it one last time but warned Tang Shazang that he would kill him if it was not true. So he went back to the quiet place and chanted Heart Sutra- the black spider came again- his time, Sha Wu Jing gathered his courage and wrote the word “Buddha” on the spider’s stomach. But the spider did not disappear- it just froze. Sha Wu Jing was very angry this time- but Tang Shazang told him that the huge black spider was actually a manifestation of his heart- it was what he truly was inside. Sha Wu Jing was asked to raise his shirt to look at his stomach. And the word “Buddha” which Sha Wu Jing had written on the stomach of the spider, appeared on his stomach- because the spider indeed was a manifestation of his true nature. When he chanted the Heart Sutta, his nature was manifested. It was not heaven’s fault- it was his greed and love for the human meat that made him kill countless of innocent human lives. When before, he had something to blame, now he knew that in reality, he was the evil one. 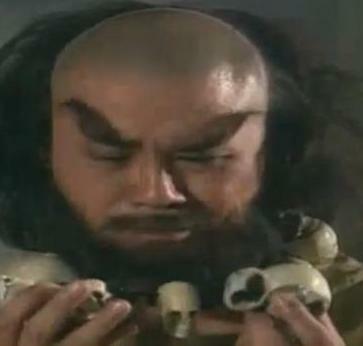 Sha Wu Jing felt so remorseful- and he removed the bone chains (comprising of human skulls) from his neck. He kneeled in front of Tan Shazang. Meanwhile, Wu Kong and Piggie came to the rescue and just managed to find the teacher. WuKong was about to kill the kneeling Sha Wu Jing when his teacher told him to stop. The accomplice was running away and WuKong decided to chase after him. The accomplice (who is actually a dragon prince) turned himself into a white horse, with hope that WuKong would not know. But WuKong had the eyes that was able to see anything in its real form. WuKong was about to kill the white horse when his teacher Ta Shazang arrived to ask him to stop. Then Guan Yin came and said that no doubt Sha Wu Jing had committed heavy sins but he has seriously repented. He was to follow as the third disciple to protect Tan Shazang’s journey to compensate against the past evil that he had done. The white horse would take Tan Shazang. Both happily agreed. And so, there are now Tang Shazang with four disciples (including the horse).